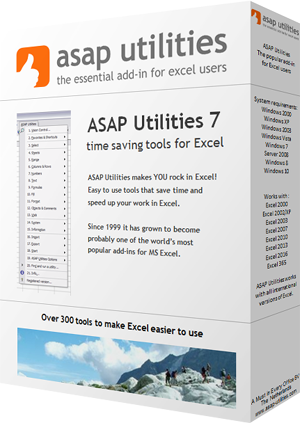 We offer free upgrades for 3 years or until the 7.9 version of ASAP Utilities, whichever is longer. For example, buying version 7.0 will get you free upgrades, at the very least, until version 7.9 is released, whether that is several years away or not. If version 8 is released within 3 years of your purchase you get all upgrades including version 8 free. All existing 5.x customers get 7.x free of charge. You can use the same license details. If you purchased a license in 2012 or earlier, then please contact us for a discount if you want to upgrade to version 7. All existing 4.x customers get 5.x free of charge. You can use the same license details. You can view our version history to get an idea on how many times a new version is released and when major version numbers are changed. Before purchasing ASAP Utilities, you are strongly encouraged to 'test drive' it using the fully functional 90-day trial version which you can download from our website. In the event you encounter a problem with ASAP Utilities then please contact us for assistance. Your quickest solution is to first consult the FAQ (frequently answered questions) or search our website before contacting us as we may have answered your question already. All refunds for credit will be issued to the credit card account that appears on the original order. After your purchase, refunds will only be given at the discretion of the Company Management due to the fact that you can use a fully functional 90-day trial version upfront for testing purposes.